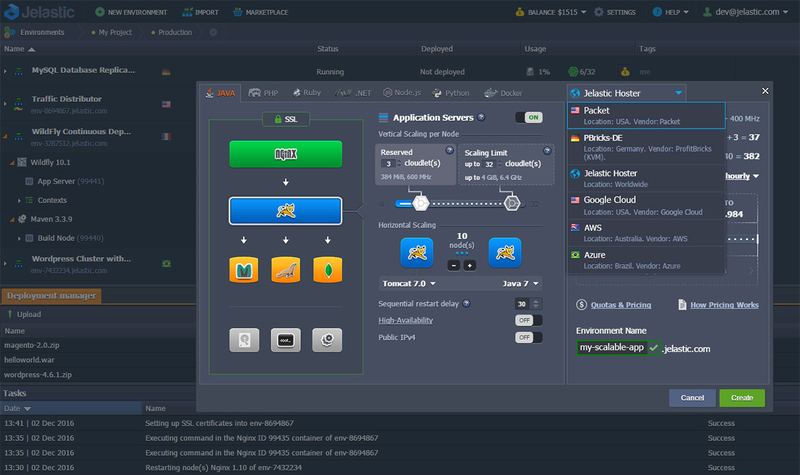 Jelastic is a flexible PaaS and CaaS with rich web UI for easy creation, scaling, clustering and smooth updates of monolithic applications and microservices. Service providers can upgrade their commodity offering (VPS, IaaS-only) with advanced technologies demanded among customers-developers, by easily installing the platform on top of Packet bare metal servers. How Does Jelastic Integrate with Packet? Many Jelastic service providers choose Packet because of the deployment speed, the high performance of the servers and Packet's global footprint. This helps to ease the entry to the Platform-as-a-Service and Container-as-a-Service market, as well as extend cloud hosting business to new geographical regions. However, the settings can be adjusted due to the needs of a service provider. “It turned out to be a very good marriage and very good decision using Jelastic platform on Packet.” Richard Lingsch, President of eApps hosting. Watch the interview with eApps president to find out why one of the top hosting companies in the USA chose Jelastic and Packet appliance and what results they’ve got. Jelastic offers a solution for service providers to extend their hosting business with Platform-as-a-Service and Container-as-a-Service, which is easily deployed on Packet.